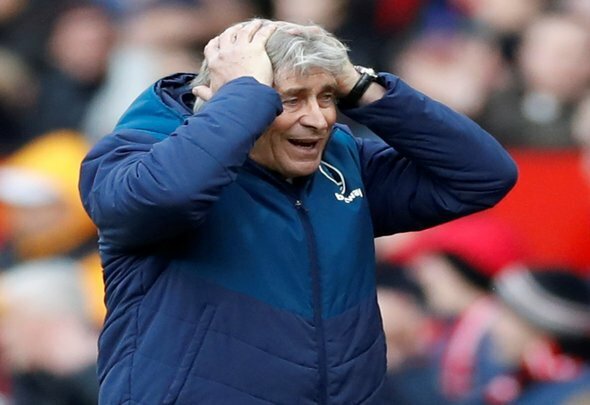 West Ham United manager Manuel Pellegrini has revealed what he said to the officials at half time of the team’s defeat to Manchester United on Saturday. The Hammers were on the wrong end of a number of questionable decision at Old Trafford, as the Red Devils were contentiously awarded two penalties and the visitors denied a perfectly legitimate goal due to an errant offside flag. Pellegrini has revealed all about his half time interaction with the match officials: “First I complained about the goal for Felipe Anderson because someone told me it was one metre on side but it was not one metre, it was more one centimetre so I told the linesman that it was not a big mistake,” he said at his post match press conference, as per Football London. “Nothing more. “Yes because they are mistakes that if you stop the TV, review it two or three times then you can see it. But for the linesman in that second, you must decide, it is not a very big mistake,” he said when asked if he’d told the linesman that he hadn’t made a big mistake. Pellegrini seemed like he took the defeat pretty well on Saturday. Obviously he will have been frustrated about some of the calls that went against his team, but he’s remaining realistic. As he says, linesmen have a split second to make a decision during a game and when things are as close as Anderson’s offside goal then it’s difficult for them to get it exactly right without the benefit of technology. Ultimately the officials need to have VAR all the time, not just in certain competitions and certain games. That doesn’t create a level playing field. That leaves too much margin for error in some games while others are scrutinised to the letter. Just have VAR in every game and then things like this wouldn’t happen. West Ham were harshly treated on Saturday, they should have got a point at least. However, Pellegrini, gracious as ever, didn’t go in too harshly on the officials. That’s a credit to him, but a bigger problem remains in football at the moment.